The Cave is an adventure game by Ron Gilbert, Chris Remo, and Double Fine Productions. 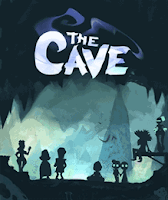 It has play mechanics similar to Ron Gilbert's first game, Maniac Mansion, where you choose three characters out of a group, leading to many different ways to complete the game and differing stories. The game is direct controlled, and the characters are able to jump. Although this means there will be some platforming elements, Ron Gilbert has always insisted that it is an adventure game, not a platformer. It was released on January 22, 2013 for PSN and Wii U, on January 23, 2013 for XBLA, and on January 24, 2013 on Steam for Windows and Mac. It was released on Steam for Linux on February 20, 2013 and for iOS on October 3, 2013. It was then released for Ouya on December 3, 2013 and for other Android devices on December 19, 2013.